New York, Paris, Atlanta? While this Southern city would not be on anyone's short list as a fashion capital, I recently attended two great museum exhibitions which go a long way towards putting Hotlanta on the couture "must visit" map. 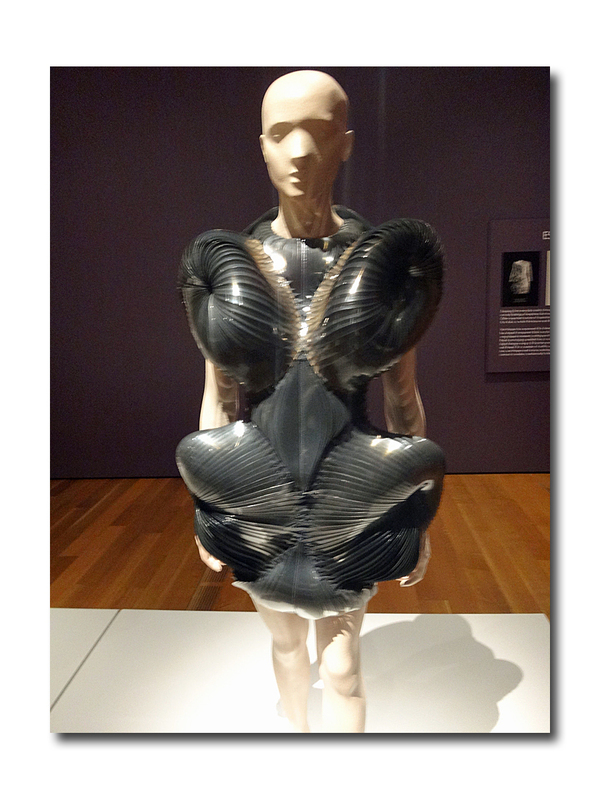 This past weekend I felt like I had a preview on the upcoming Metropolitan Museum's Spring 2016 Exhibition of Manus x Machina as I viewed "Iris van Herpen: Transforming Fashion" at Atlanta's High Museum of Art (high.org) on view through May 15. The Met Museum is planning to showcase several of her works as well since they are on the forefront of the relationship between what is handmade vs. technologically produced. 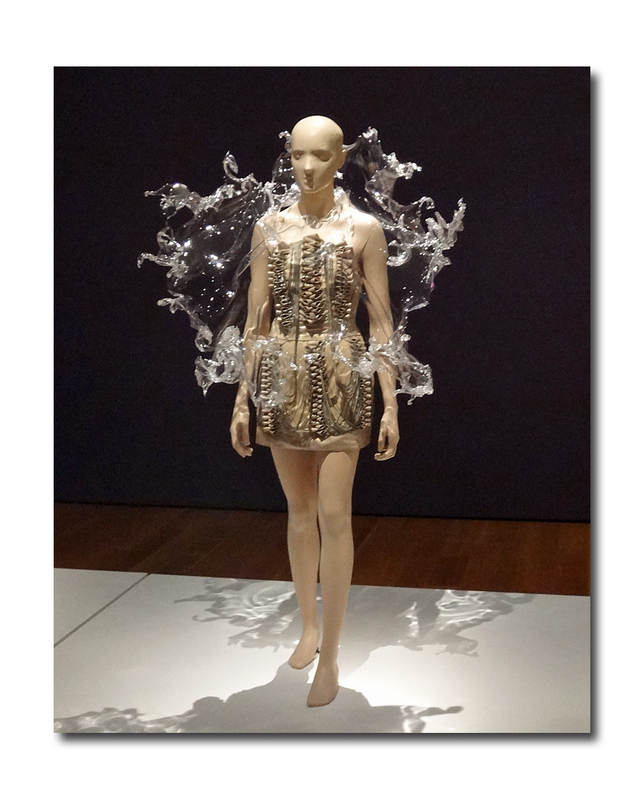 The High Museum is the first US exhibition for Iris van Herpen as well as their first fashion exhibition ever--a high water mark to live up to for any future fashion exhibitions. 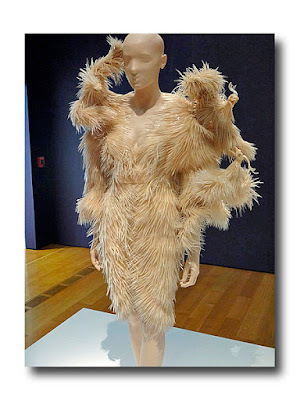 If you are at all familiar with van Herpen's work (she dressed Lady Gaga in her experimental period as well as Bjork) you will not go there expecting to see clothing that you can actually wear. 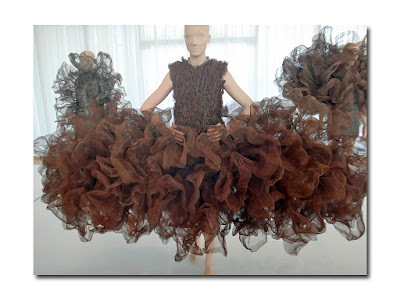 Instead think of what would happen if Project Runway's unconventional challenge, its avant garde challenge and its 3-D challenge were all rolled into one and placed in the hands of an artist/nature enthusiast/mad scientist. The graduate of ArtEZ Institute of the Arts Arnhem, now 31, began collecting various materials when she was 18 but says she didn't know why. A former ballet student and native of Amsterdam, who still works from her studio there yet shows at Paris Fashion Week producing two collections a year, admits to being more influenced by nature than technology. 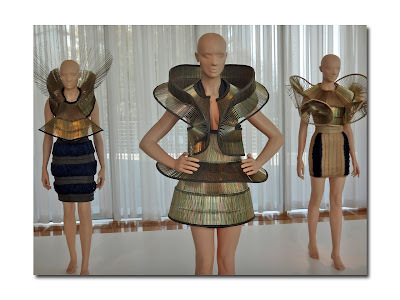 This exhibition features 45 outfits spanning from 2008 to 2015 incorporating materials as diverse at the spokes from children's umbrellas, various resins, polymer, goat leather, tulle, stainless steel, PET (polyethylene used in plastic bottles), transparent PVC, Swarovski crystals, hand blown glass balls and laser cut acrylic sheets. 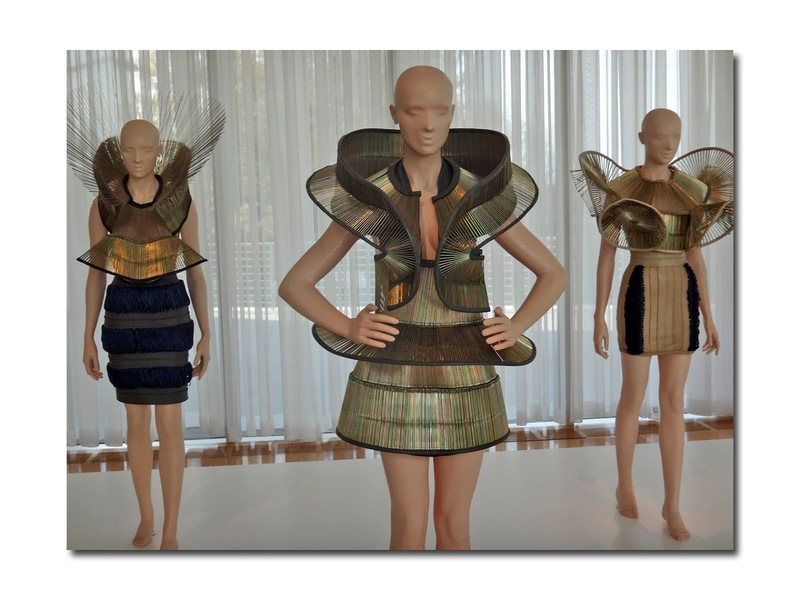 The outfits are grouped together by collections inspired by everything from outer space to microbes, biology to micro conductivity. The effect is dramatic, cool, creepy and surreal. 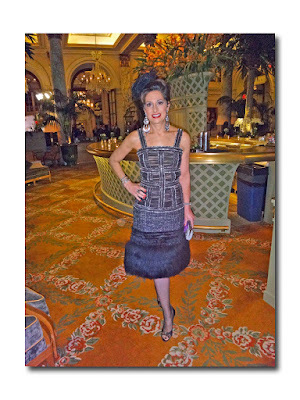 The designs are shown on custom built mannequins made to exacting specifications; there is no "wiggle room" or give in a strapless "glass" dress supported entirely by how it sits on the hips. I found it of note that IVH cites being influenced by her dance background and credits "movement" as an inspiration. 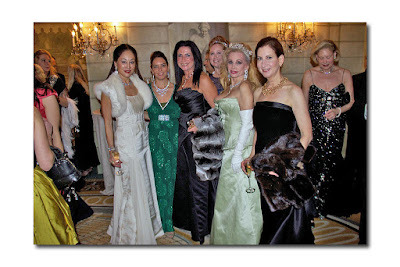 There is some movement in the look of the pieces themselves however it would be near impossible for the wearer to freely move around in these outfits as many are quite restricting either at the neck, chest or hip area. In the accompanying video you do get to glimpse the models coming down the runway with great care as well as with flesh colored under covering as several of the items are completely transparent. While many of the fashions and footwear (in collaboration with Noritake Tatehana) are reminiscent of Alexander McQueen for whom van Herpen interned, they also brought to mind some from the Susanne Bartsch Fashion Underground exhibition at FIT, albeit with a handmade organic 3-D twist. 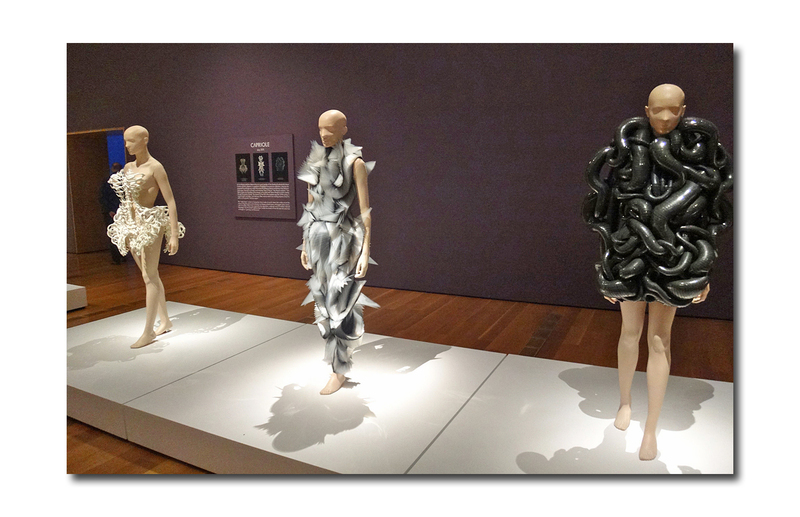 Van Herpen explains in the video that her influence is primarily through nature rather than technology and that she enjoys trying to "control the chaos" of an unyielding material. About her design process, van Herpen says she sometimes sketches a design while looking at a potential material. Working in collaboration with other artists she " enjoys the challenge of getting it to do something it's not meant to do." Examples of this include her creation of a "water dress" (made out of taking a blow torch to the PET Polyethylene material somehow making it look like a giant liquid splash) and a steel dress that appears as if it's enveloped in oxidized smoke. 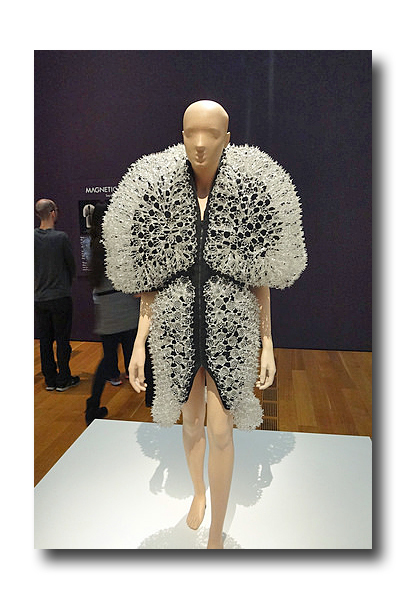 Interestingly, van Herpen addresses the fact that often what is made by technology in terms of 3-D printing can be reproduced by hand after seeing how it is done by machine, however it will just take longer. It is indeed impossible to know exactly what was handmade and what was machine made when viewing any of her seamless fantastical finished pieces. So much of Iris van Herpen's collection is almost begging to be touched and I found myself fighting the strong impulse to do so. To that end I was very happy to reach the last part of the three floor exhibition to find a "please touch" display featuring samples of some of her more unusual materials including the heated resin which truly looks like a mossy lichen on a dress but in actuality, is a rubbery textile created by applied heat and magnets. 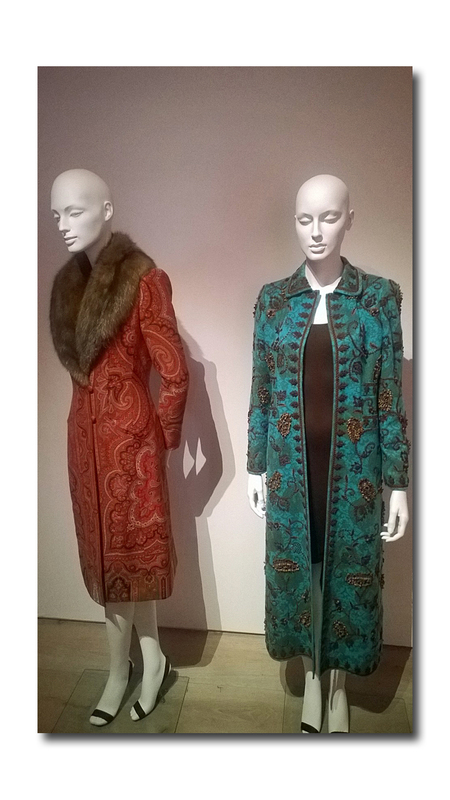 The other exhibition which I viewed (just down the road from the High Museum), was one that I had previously written about: see article in the form of its companion book: Oscar de la Renta: His Legendary World of Style by Andre Leon Talley. I hadn't realized that this exhibition was "hitting the road" however it is on view until December 31 at the brand new SCAD Atlanta (scadfash.org) in slightly modified but larger form than its initial Savannah viewing. 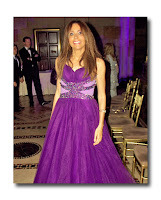 Huma Abedin's wedding gown, outfits worn by Anna Wintour (Abedin and Wintour both wrote forewords in the book) and many more. The young student docents are there with iPads to show you how the dress was worn which is a nice touch. The accompanying video is a documentary which was produced by a SCAD Savannah student detailing her experience while working to put the exhibition together. 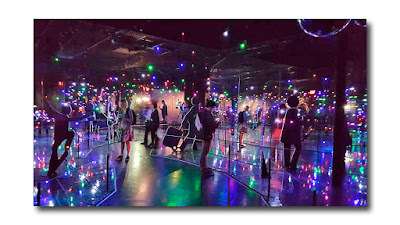 A note of interest in comparing the two exhibitions: although they are both very much worth seeing, know your audience. I was accompanied by my husband, daughter and two boys in their early twenties (my son and my nephew) for the Iris van Herpen exhibition and they were loving it however I would not ever subject the boys to the de la Renta exhibition which I'm sure they would find a complete snoozefest. 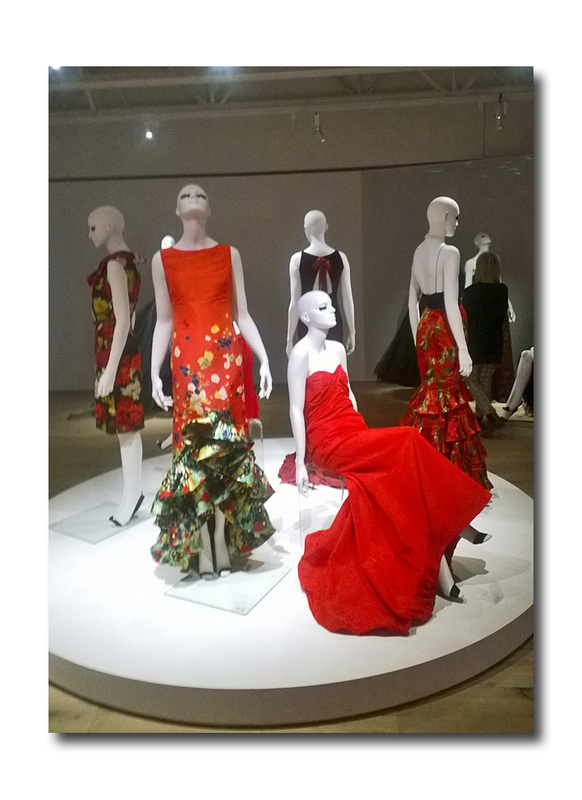 On the other hand, if you are someone who appreciates fine design and workmanship of a more traditional nature then you might prefer the OdlR exhibition. On the evening of November 23rd, the crowd gathered for the premiere of Saks Fifth Avenue’s new holiday light show witnessed a sound and light extravaganza that transformed the façade of the luxury retail store into a Winter Palace complete with icicles of light, crystal palace spires and enough pyrotechnics (from Fireworks by Grucci) and music to rival a Super Bowl halftime show. 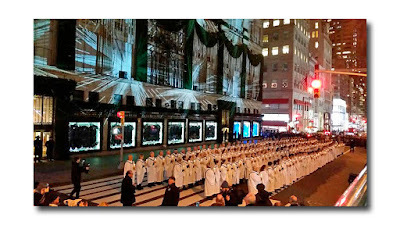 After an introduction by Saks president, Marc Metrick, the show began as 200 choristers from the Oratorio Society of New York and the Cathedral Choristers of the Cathedral of St. John the Divine streamed onto Fifth Avenue from inside the store, filling the street with a special rendition of Carol of the Bells and signaling the start of the light show which featured more than 225,000 points of controlled light. 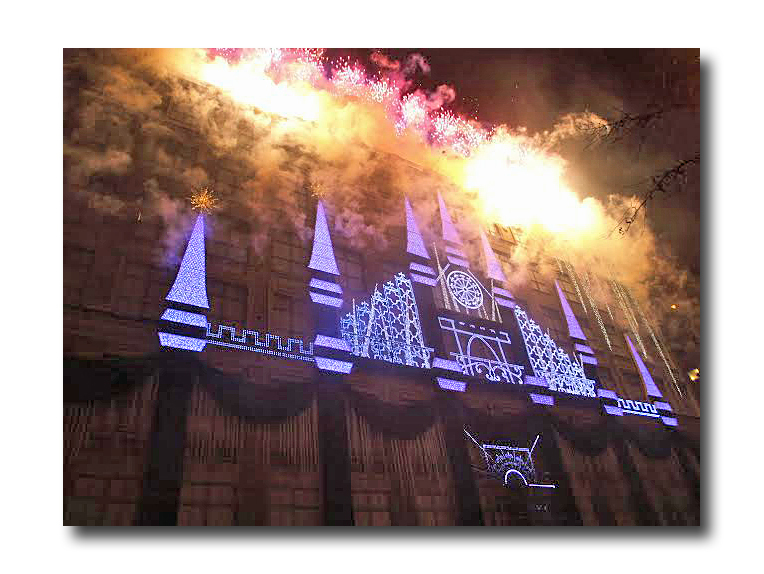 In addition to viewing the spectacular Winter Palace premiere, members of the audience were given LED wristbands, called Xylobands, which interacted with the controlled light elements and fireworks, allowing them to actually become part of the show. The evening also included the unveiling of the Saks Fifth Avenue holiday windows. The theme for 2015 is Winter Wonders of the World, featuring fashionably attired figures in fantasy-like winter visions of some the world’s most iconic sights. 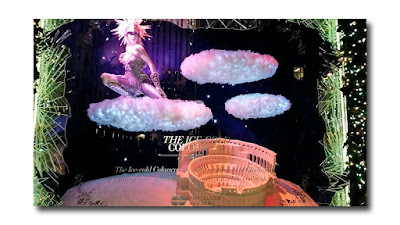 In one, a Gladiatrix battles above a frozen Colosseum and in another a mermaid of ice is immersed in the frozen Great Barrier Reef. In a poignant nod to the recent events in Paris, a window showing an icy Eiffel Tower includes the hashtag: PRAYFORPARIS. 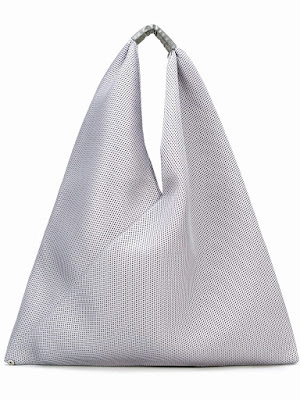 The phrase “It Bag” has been thrown around ad nausea within the annals of fashion for several decades. 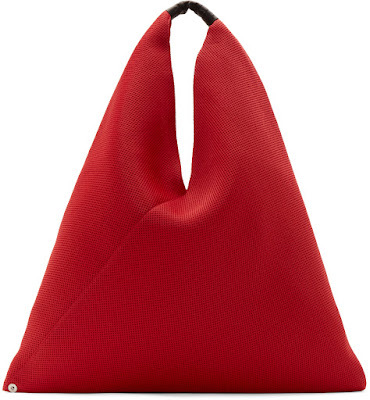 According to Wikipedia, “The term was coined in the 1990s with the explosive growth of the handbag market in fashion. Designers competed to produce a single, easily recognizable design which, if cleverly marketed, endorsed by the fashion press, or seen being carried by a celebrity, would become that season's must-have bag, selling in large numbers”. 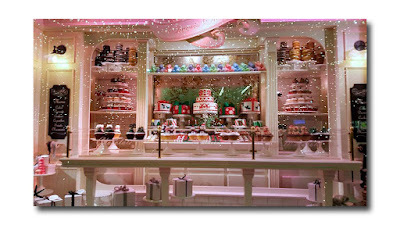 But I say, “Different strokes for different folks”, and naturally, the idea of what is an “It bag” may vary from one person to another, or to paraphrase Bill Clinton: “It all depends of what your definition of ‘IT’ is.” While I understand the appeal of certain highly sought after iconic luxury bags, after they become mainstream, they will invariably be knocked off all over the world. Because I prefer to be more individual, and NOT look like a carbon copy of everyone else, my tastes tend to gravitate to those items that are less obvious and a bit more under the radar than traditional status symbols. Even better when they’re the bi product of well thought out design, combine form and function, and are available at a price that won’t insult your intelligence. The essence of modern! 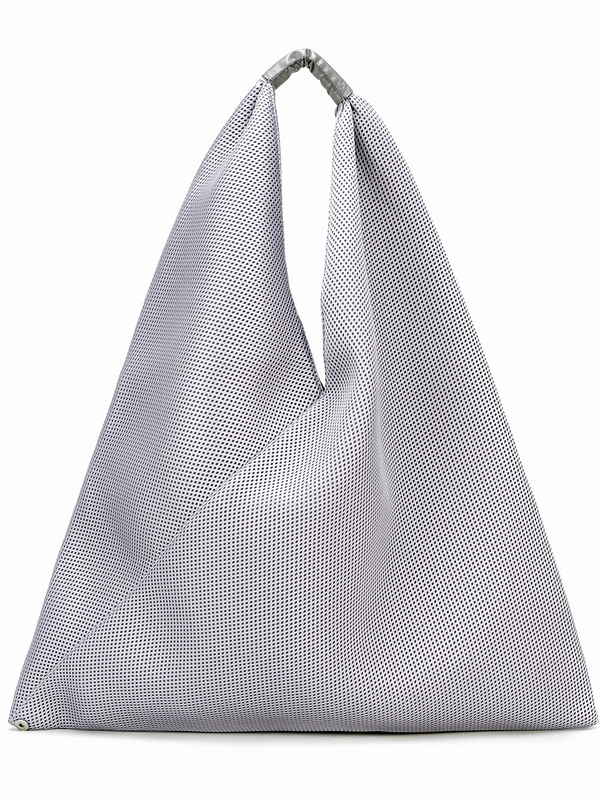 All of which perfectly describe the signature plush double mesh neoprene triangle hobo bags for MM6 by Maison Martin Margiela, $185- $195. 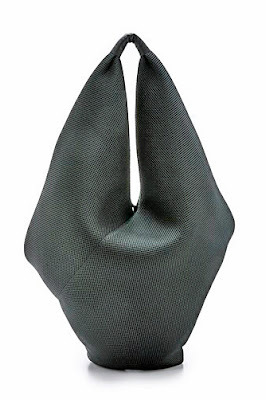 Roomy (21.75” H X 20” L; 14” X 19” when folded flat), lightweight and foldable, they are perfect for toting, shopping, and traveling. They are made of durable polyester, feature an open top with an interior silver snap fastening tab, and are cotton lined with a deep pocket inside that snaps shut. A snap fastening tab at the bottom allows you to change their size and shape in an instant. The single handle with leather detailing is perfectly sized to allow you to carry it three ways: it can be hand held, you can carry it in the crook of your elbow, or wear on your shoulder. Initially offered in red, black, and gray, they would make a most welcome holiday gift (for you or a good friend, or both!). They are being sold at MM6 stores (363 Bleecker Street, 646 664 1655; 91 Grand Street, 646 781 7852), and online. www.ssense.com has a red version has a available. 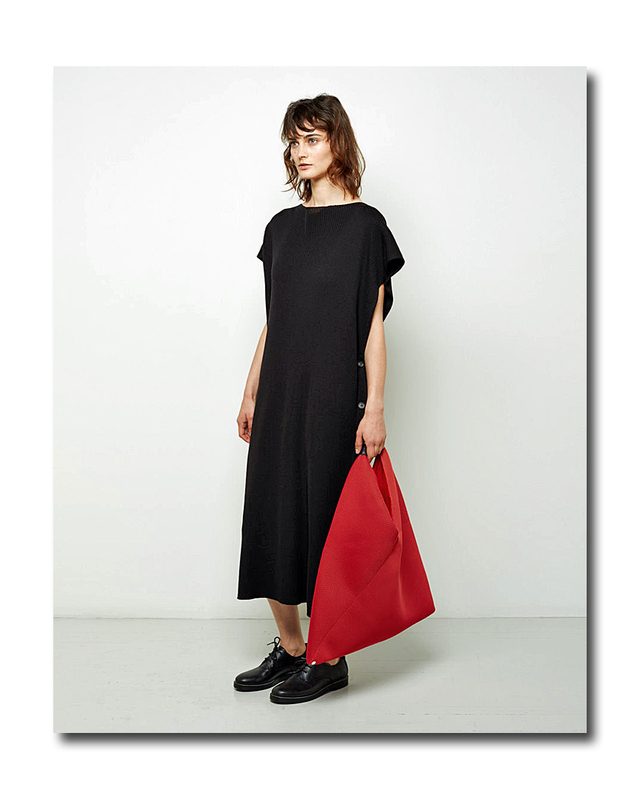 www.shopbop.com, are available in red, black, and gray, and they are now 30% off. "If These Jewels Could Talk" They'd Probably Never Shut Up! 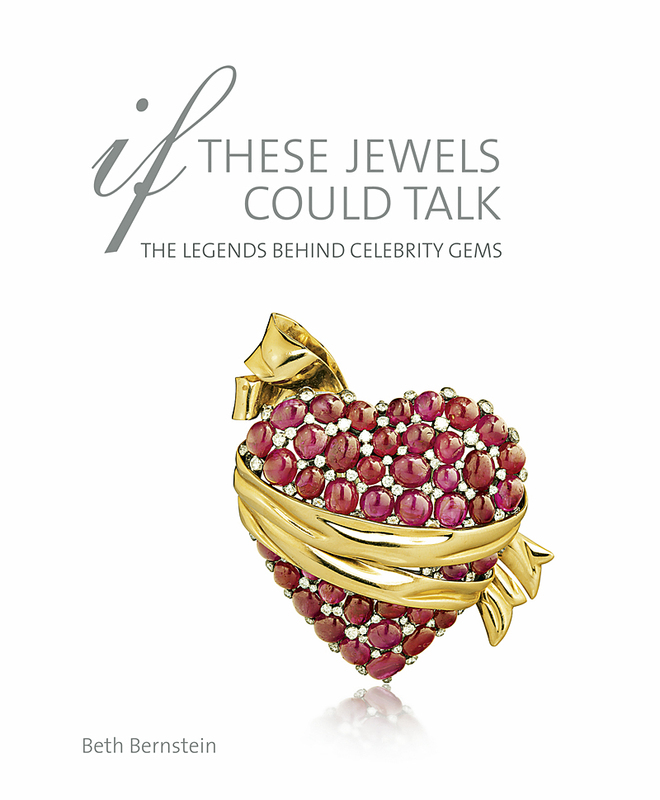 Beth Bernstein's third and latest book "If These Jewels Could Talk: The Legends Behind Celebrity Gems" (due out November 23) has a lot in common with a fine, vintage wine -- the "grapes" for the book were aged 22 years. 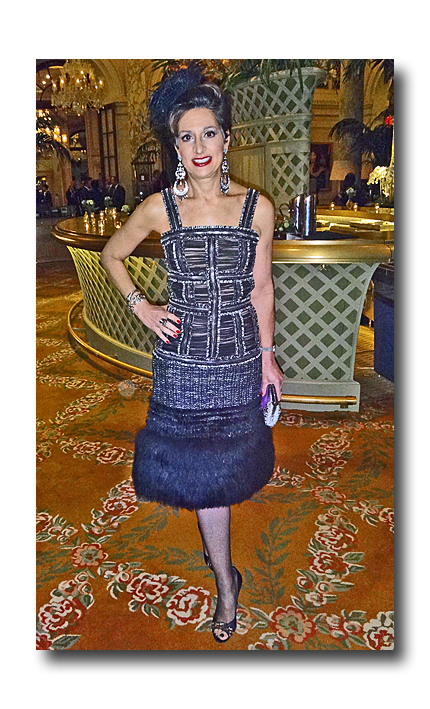 Author, consultant, jewelry designer Bernstein's initial ingredient or idea "stems" from a childhood fascination with the style and glamour of Old Hollywood as represented by the stars of the silver screen who would often wear their own jewelry in a film. 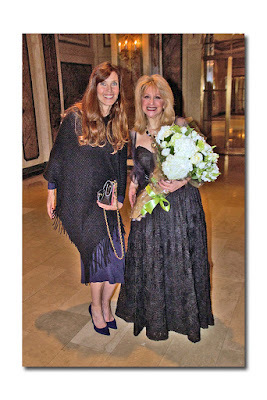 As I previously mentioned in my Doyle & Doyle book signing article, as a child Bernstein would stay up late with her grandmother, re-watching all their favorite old movies, dressed up in rhinestone tiaras whilst imbibing ginger ale out of champagne glasses, all setting the stage for this compendium. The book shines like a well cut stone in several ways. 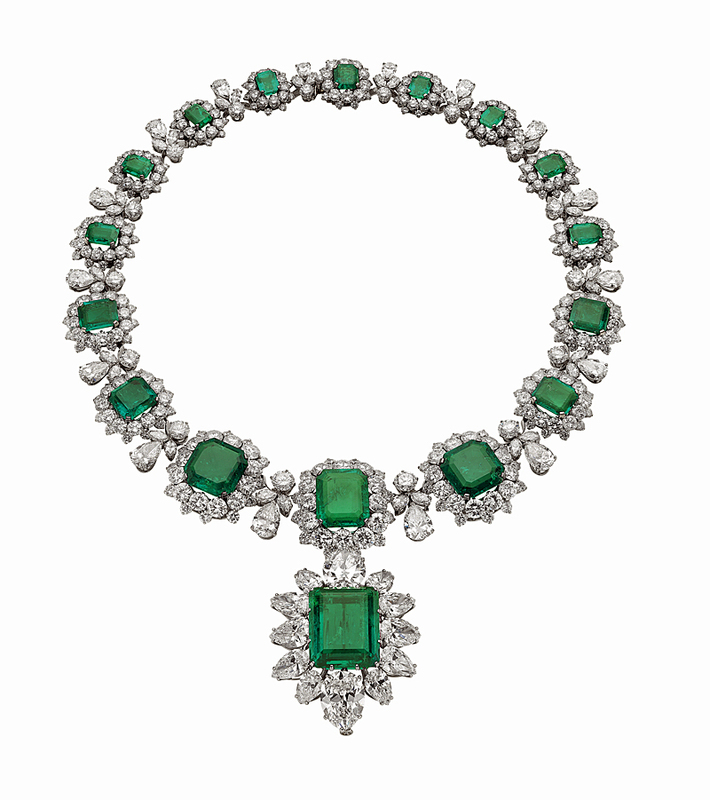 The first five chapters detail the various gemstones individually (sapphires, emeralds, rubies, diamonds and pearls) cataloging which famous women preferred which as well as how they were acquired, designed into jewelry, worn and eventually sold. 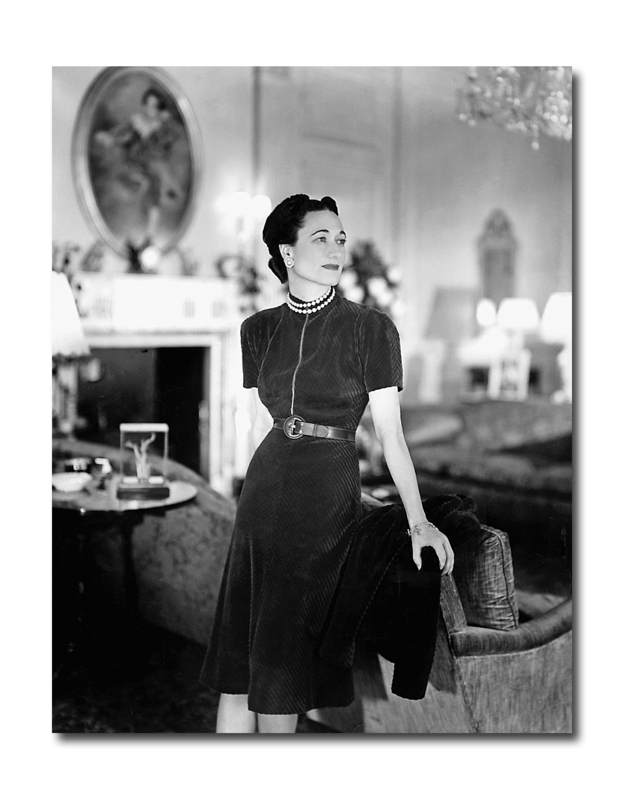 There are many fascinating anecdotes: Marlene Dietrich accidentally baked her 37.41-carat emerald cabochon ring into a cake at a dinner party; Elizabeth Taylor's dog found the famous La Peregrina 35mm pearl, once owned by Queen Mary I of England and Queen Isabella of Spain, a good chew toy; Elizabeth Taylor's one-time husband Mike Todd secretly commissioned a pair of her paste earrings into real diamonds to which an unsuspecting La Liz remarked that they "felt different on her ears." 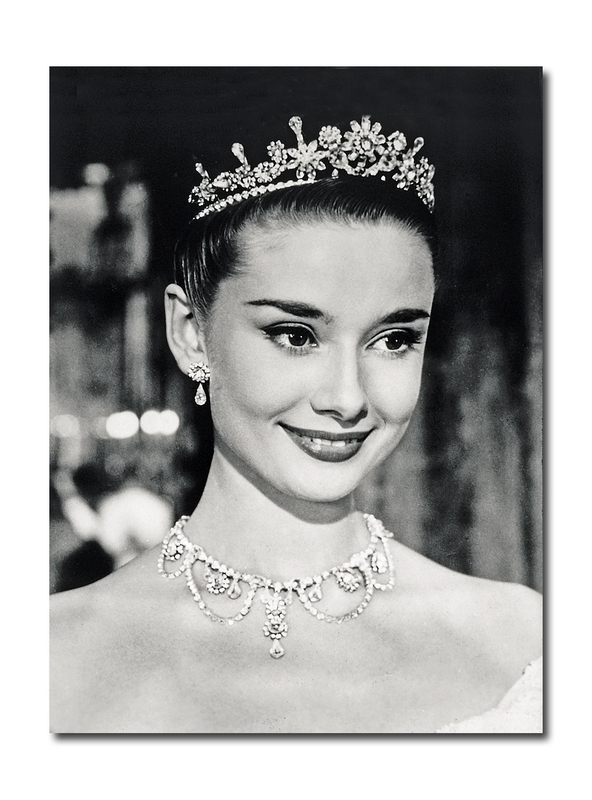 The other chapters of the book go into further detail and explanation about the role of gems in movie roles. Sometimes the jewelry was integral to the plot as in "To Catch A Thief", or could even involve a tie-in such as Audrey Hepburn in "Breakfast At Tiffany's." At other times the jewelry seemed to be worn despite the fact that it was not even of the designated time period as in Rudolf Valentino's Cartier Tank Watch which appeared on his wrist in a still for "Son of A Sheik." 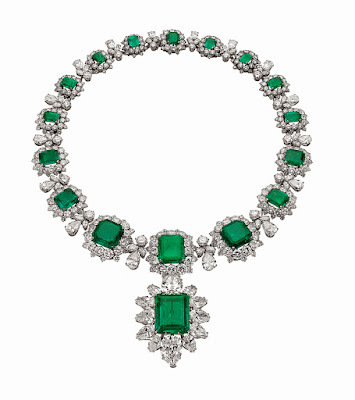 Notable pieces are profiled whether owned by royal jewelry collectors/enthusiasts such as Wallis Simpson (The Duchess of Windsor), Grace Kelly, Princess Di and Queen Elizabeth; Hollywood legends such as Carole Lombard, Mary Pickford, Jean Harlow, Myrna Loy, Marilyn Monroe, Gina Lollobrigida; current celebrities such as Beyonce, Gwyneth Paltrow, Kim Kardashian West, Jessica Simpson and Emily Blunt; or even past and present political figures like Jackie Kennedy and Michelle Obama. 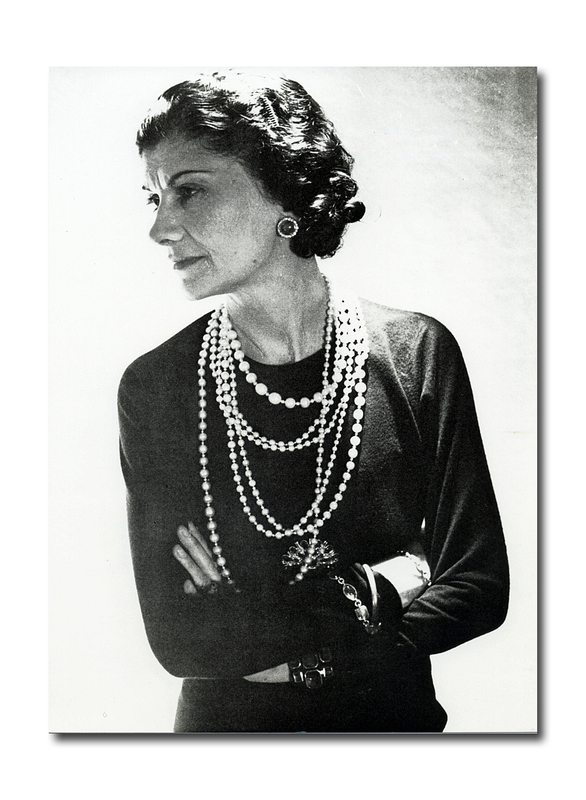 Of course, Coco Chanel is in a class by herself as she was the first proponent of mixing real and faux pearls (high and low) all together at once. 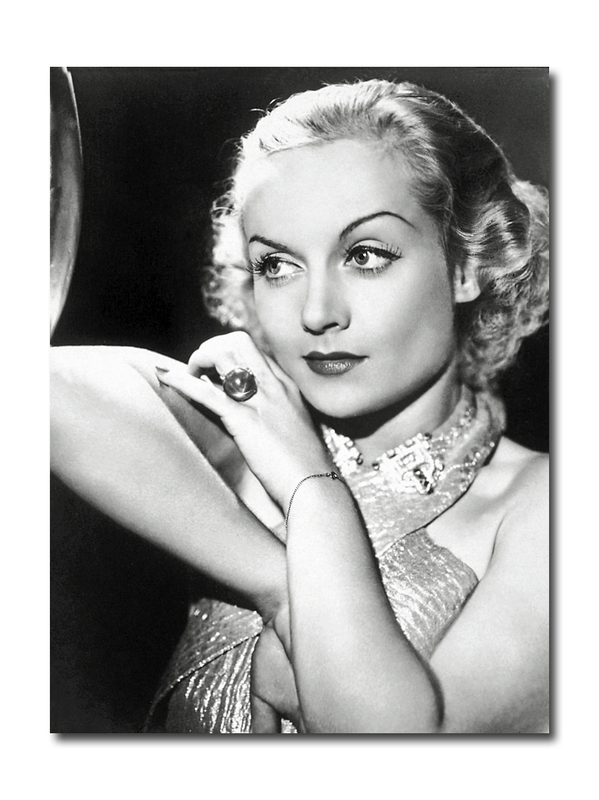 It's also interesting to note the amount of jewelry that was worn in the hair by some of the stars of the '30s and '40s including actual brooches and clips not originally intended for that use. I would have liked to know a bit more about how the on screen fashions were selected. Were they in coordination with the jewelry or perhaps influenced when the wardrobe designer sketched it? 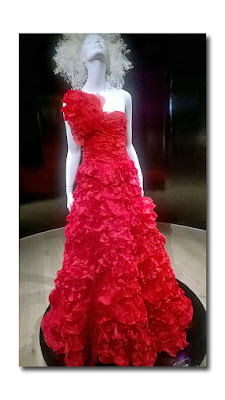 Not directly related to the book but in a similar vein and also happening Monday is an auction at Bonhams in conjunction with TCM called "Treasures From The Dream Factory" featuring the jewelry of Natalie Wood as well as costumes worn in films such as Judy Garland's Dorothy dress from "The Wizard of Oz," and a gown from "Easter Parade," Marilyn Monroe's red gown from "River of No Return" and skirt suit from "Gentlemen Prefer Blondes" along with costumes worn by Lana Turner, Merle Oberon, Sophia Loren, Grace Kelly and a white suit that Katherine Hepburn wore while promoting "African Queen". The last section is a directory of all of the famed jewelry designers mentioned throughout the book including those who have gone out of business such as Trabert & Hoeffer-Mauboussin, and Paul Flaco to those who are going thriving today such as Tiffany, Bulgari, Verdura, Cartier, Van Cleef & Arpels, Harry Winston and David Webb. If you have a strong interest in fine jewelry or are fascinated to the point of voyeurism in how "the rich are different from you and me" then definitely pick up this book. 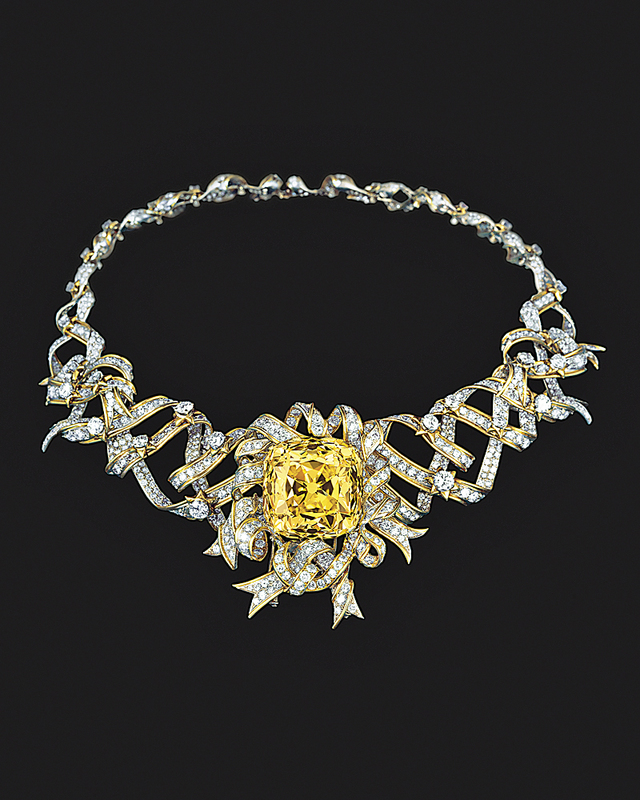 As someone with a little third hand knowledge of collecting and auctioning fine jewels, I found that although the book visually resembles a Sotheby's or Christie's Fine Jewelry catalog, it is informative and mostly succeeded in keeping my attention in all but the most descriptive and technical parts. 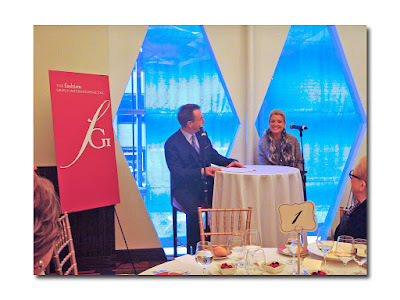 Attending the FGI luncheon at Le Cirque on Wednesday brought me back to a time in a distant galaxy when both the internet and my children were in their infancy and I faced a not-so-secret addiction to televised home shopping. Upon learning that the featured speaker was none other than Mindy Grossman, CEO of HSN, Inc. (#22 of Fortune's Top People in Business 2014, Forbes World's 100 Most Powerful Women, a UNICEF board member) who would be joined on stage by friend/neighbor of 25 years Michael A. Clinton, President/Publishing Director of Hearst Magazines (also highly celebrated in photography, running marathons on all seven continents and philanthropy), I was a little startled. I had recently been wondering how the shores of the home shopping channels (even that phrase seems antiquated to me now) were faring amidst the turning tide, uniform acceptance and ubiquity of online and other digital shopping platforms. 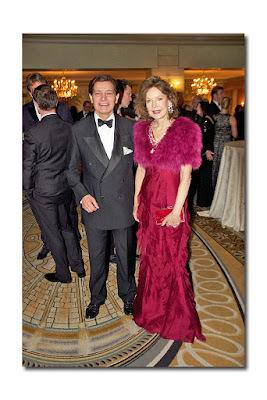 Even I have not shopped "from TV" in over a decade. 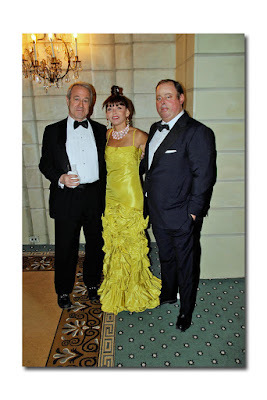 This curiosity was in turn fueled by reading about Jennifer Lawrence's upcoming turn as Joy Mangano, industrial designer and inventor of that old home shopping staple, the Miracle Mop, in the David O. Russell feature film "Joy" due out Christmas day. 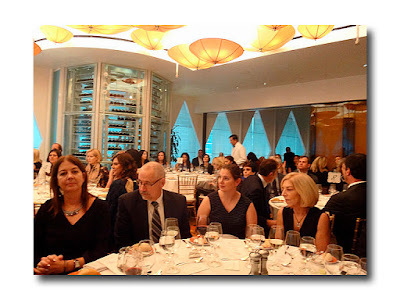 I was thankful when the dessert (creme brulee with berries) was served and the speakers commenced. 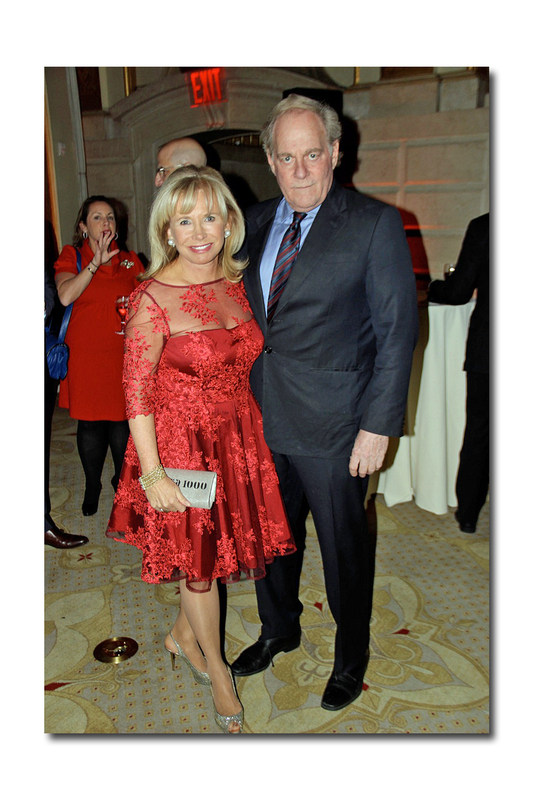 After FGI's President Margaret Hayes introduced Kate Kelly Smith of Hearst ("the most important of our corporate sponsors"), Kelly introduced Publisher Clinton. "Mike with a mic" (as he called himself) then introduced businesswoman Grossman who has the "disrupter" gene and that's a good thing. 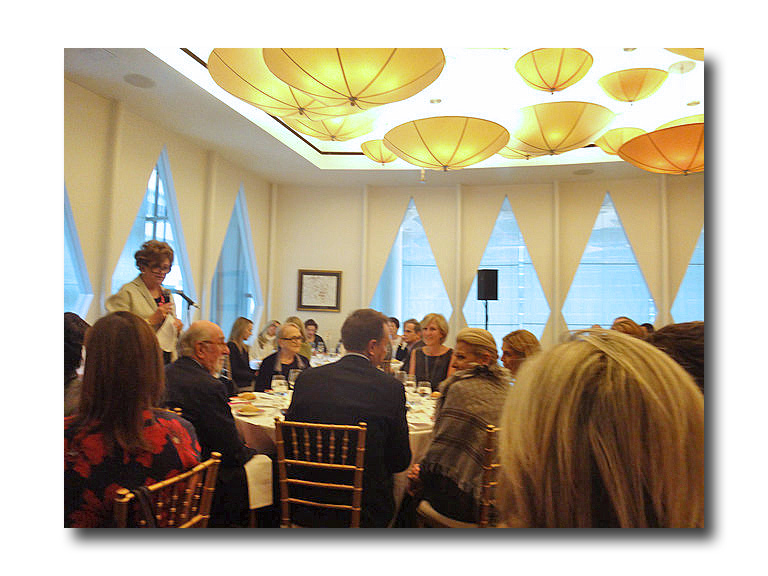 "She's at the vortex of the disruption between media, technology and retail sitting front and center" he added. As we in the audience learned, she has always been a risk taker. The adopted daughter of parents of meager means (her father sold produce) was the first to go to college, which she did at 16. She was engaged at 19 to her high school boyfriend and preparing to attend law school -- "I was every Jewish mother's dream" except that something snapped. She decided against law school, against marriage and instead moved from Long Island to New York City. Fittingly, her advice to the Millennial generation: "If you're 23 and you're probably gonna live to be 100, you have time to do some other things with so many options open to you." She stressed that the guidelines include doing something "purposeful" with an "impact" and that there is a difference between "risk and suicide." 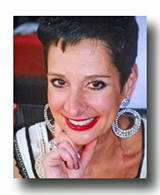 Although she did not find it a hindrance as a female in the business world she now works hard to promote diversity in the workplace. 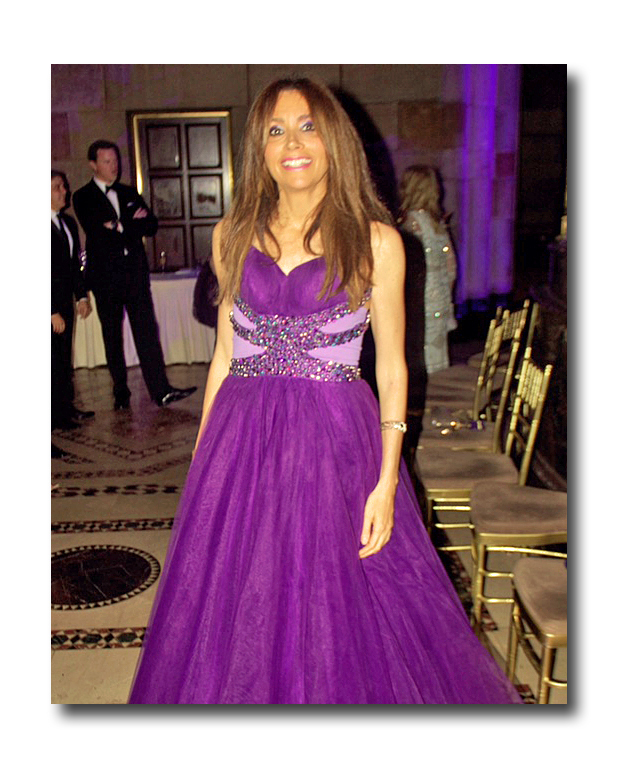 Grossman began her climb in the fashion industry through menswear labels Jeffrey Banks, Williwear by Willi Smith, Tommy Hilfiger, Ralph Lauren and eventually to Nike as VP of Global Apparel from 2000-2006 when she made the leap to HSN. When she got to the revolving door of HSN as the eighth CEO in 10 years she learned that if you have a platform and a voice you should not waste it. On the subject of the importance of maintaining a culture of collaboration and passion ("If there is a strong one you feel it as soon as you walk in") and it should begin from the ground up rather than from the top down. She also stressed that the corporate culture has to align with an individual employee's values in order for the individual to engage which is one of the things that HSN looks for when hiring. Incidentally, the culture tagline at HSN is "It's fun here" is something that employees should be able to get behind. Grossman also discussed specific points that are integral to the success of HSN including the idea of "storytelling" and putting the right product together with the right celebrity. She is responsible for elevating the content to what she terms "editorial programmed commerce" as well as learning to ride the wave or explosion of mobile centric (rather than television-based) shopping. Much like IMG has done with Fashion Week, HSN is striving for informative entertainment; even forming a partnership with Disney. "The world has ADD so you better engage them quickly" she added. 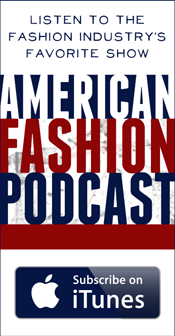 HSN is reaching across digital platforms such as AOL and Periscope which they did with the Serena Williams show during Fashion Week. Also crucial is the ability to "pivot." "Agile is the new smart" has become a mantra at HSN according to Grossman. The five "C's" that they are focusing on are: creating Content (meaning product exclusive to HSN, now at about 70% of inventory), reaching for new Communities (for example Univision), Commerce which includes being able to execute as needed, Customization and Convenience. Recognizing that HSN has a "formidable competitor" in Amazon as well as their direct (and larger rival) QVC has made them realize that they have to do things a little differently. Towards that goal they have even sold air time to Toyota to teach women how to buy a car -- one of the "Pain Points" in life that Grossman alludes to wanting to address/find solutions to on air in the future. 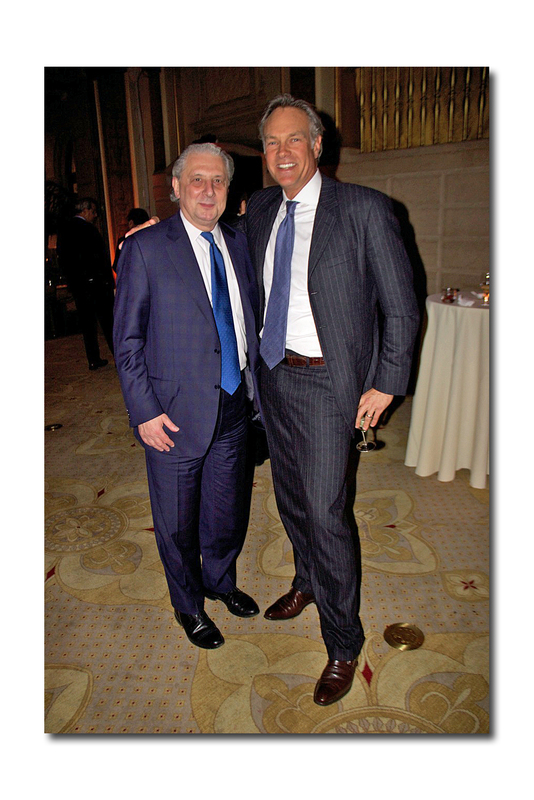 As moderator we did not hear too much from Clinton however he did mention that Hearst was having its "best year ever" (hard to believe when Conde Nast is in the midst of an "annus horribilis" including layoffs, closures, and general reshuffling of the deck chairs on the Titanic). He also touched on something recently in the news; Hearst's co-branding of a product called "Sweet" on the Snapchat Channel and that different content would be available here and on their websites than in print. 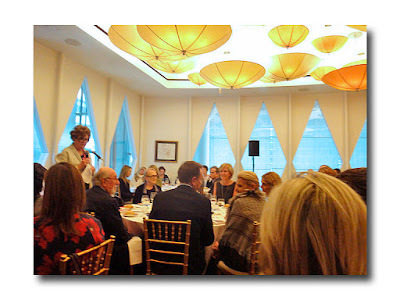 In her role as Vice Chairman of the US fund for UNICEF, Grossman added that she had just come back from a Guatemala field trip ("difficult and inspiring") and that they were able to get the government to change the marrying age from 14 to 18. 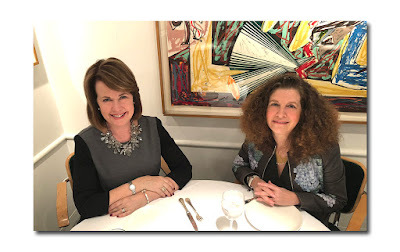 Empowering women and children is obviously important to Grossman, not only in her day job but in her "circular life" which includes all facets from career to personal time in which she's a wife and mother. On Thursday night, the holiday season officially began in New York City when Lord & Taylor’s Fifth Avenue flagship store unveiled its holiday windows for 2015. 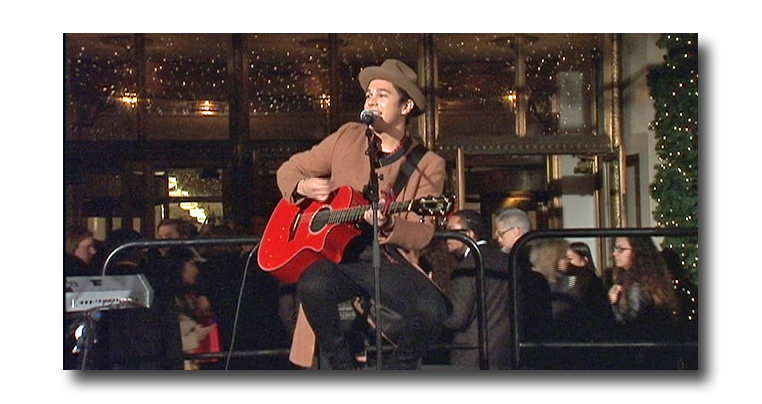 Singer Austin Mahone was featured at the event which marked the 78th year that the company has given this special “holiday gift” to the city. 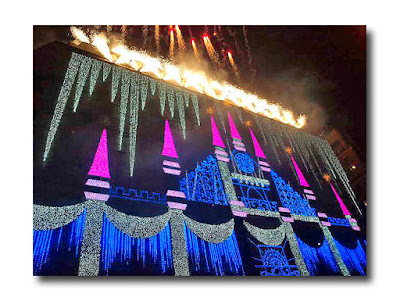 The animated windows depict traditional holiday scenes. 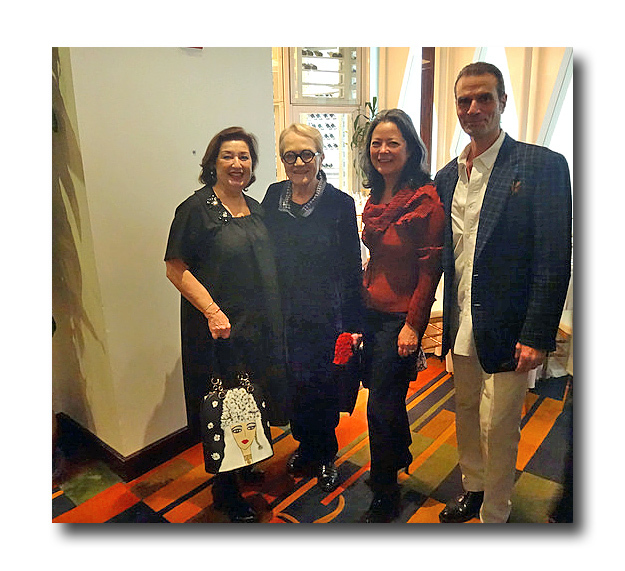 Liz Rodbell, president of Lord & Taylor, was on hand for the unveiling, which was just one of the highlights of a special Charity Day in the store to kick off the 2016 partnership between Lord & Taylor and Habitat NYC. 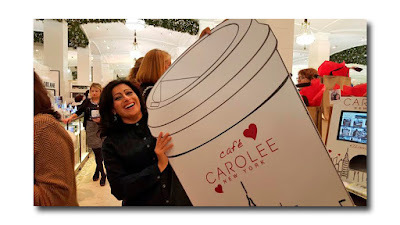 Throughout the day, many of the stores’ vendors, including Carolee, Movado, Carmen by Carmen Marc Valvo and many others, featured special promotions creating a “carnival-like shopping extravaganza.” Customers were treated to a Carolee coffee and photo bar, hot chocolate and cookies from Movado, a candy bar courtesy of Calvin Klein, Chloe, Marc Jacobs and Philosophy and much more. Customers could purchase a $5.00 Charity Ticket for which they received in store discounts. 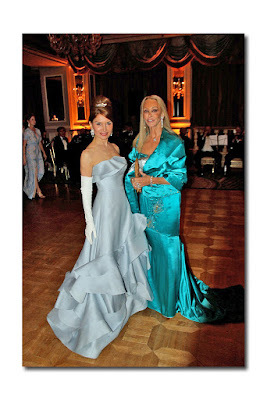 All of the proceeds from the ticket sales will be donated to the Lord & Taylor Habitat NYC project. In addition, the store and its participating vendors will make a contribution to the project to fund the rebuilding of a single family home in Queens next year. What is the human microbiome? It consists of the trillions of microbes that live in and on your body (together they weigh about three pounds). Most of the ones living inside you are actually vital to keeping your body, and even your mind, functioning properly. The intricacies of this complex ecosystem are explored in depth in the American Museum of Natural History’s new exhibit, "The Secret World Inside You". 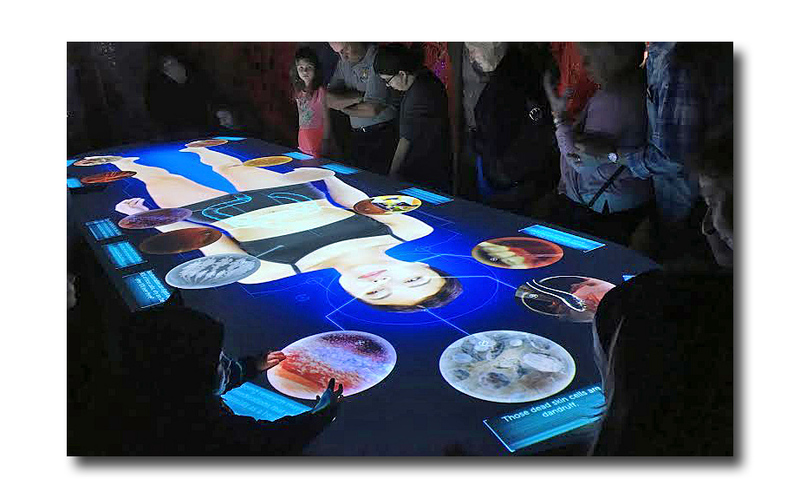 One of the exhibit’s most intriguing aspects is The Body Table; an interactive table that displays a fourteen foot projection of a pregnant woman’s body. 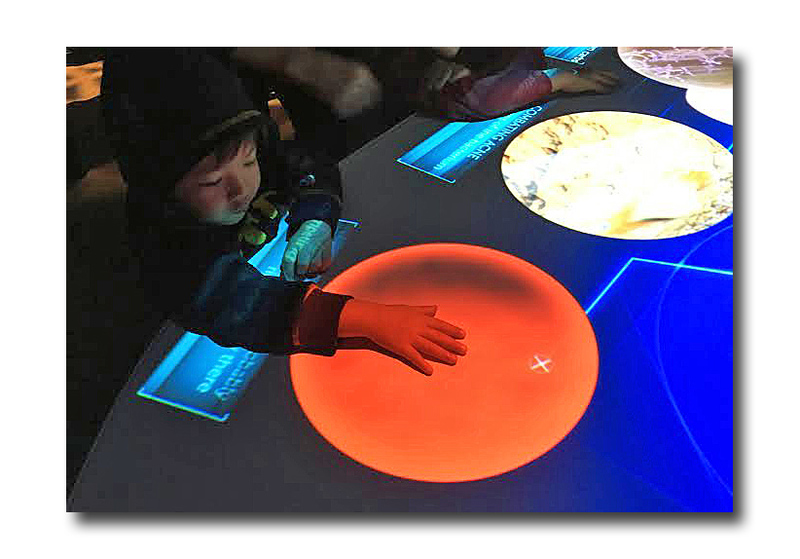 By touching different areas of the display, visitors can learn the ways that microbes impact human health. The woman in the table actually speaks to and interacts with visitors as they explore the seventeen animated microbial scenes. She was created from a real life model, who was chosen through a casting call. What was your role in putting The Body Table together and how much time did you spend working on the project? Joe Levit: I’m the writer/researcher on the media team within the exhibition department. That means I normally complete the logic, conduct the research for and write the content that will appear within the team’s media interactives (not including films, which our colleague Sarah manages or handles). For this show, I was almost exclusively working on the content for The Body Table, because there was a lot of research to do for such large project. In addition to selecting the stories we wanted to tell in the Table, I wrote the narration that the actor conveys and the text for each of the 17 animated stories. I also did a lot of research regarding the ecological relationships between us and bacteria, or bacteria versus other bacteria, and provided our animator Bob with some visual references for each story. I spent the better part of 7 months doing this. Bob Peterson: I am the animator for The Body Table. How Long did it take? Over a period of months, as the curators and everyone in the exhibitions department contributed their incredible ideas and creativity. Eozin Che: I’m the programmer for this Body Table project and I spent 1 month + one week. What was the biggest challenge that you faced in putting it together? JL:The biggest challenge I faced personally was finding the answers about how these interactions probably actually occur. Keep in mind that many of these interactions have never been shown before in public in an animated way. We are breaking new ground with many of the stories, bringing unseen battles and assistance to life for viewers. I think the biggest challenge for the team as a whole was figuring out how to meld the narration and stories as seamlessly as possible, from both a story and graphics standpoint. That took a lot of time to discuss and figure out. BP: This field of study is so cutting edge and there is so much to explore and discover. In working closely with Robert DeSalle and Susan Perkins it was a fun challenge to recreate these amazing ecosystems and the creatures who inhabit them.The head of our department Helene Alonso gave us incredible direction and freedom to create and explore these unseen worlds for The Body Table. Our project director Ariel Navarez did an incredible job helping design the table and directing the talent. Brett Peterson and Eozin Che were the wizards behind the programming and Joe Levit did a great job with his research and writing. We had a blast and we all learned so much working on The Body Table. We just hope the visitors exploring these “unseen worlds” at the exhibit have just as much fun as we did creating this experience . EC: The biggest challenge I had was the application’s performance issue. Since we have many different visual contents including background video and animation,17 feature players, animated sensors, lines and sub-images, it was definitely challenging to get everything work well together in appropriate play speed without any delay. I tried a couple of different iterations in code structure and solved the issue by using image sequences to play videos instead of normal movie clips. (So now, each animated body story is a sequence of over 1500 images) Now you can check high-resolution animations in the most smooth speed in the Body Table. What is your favorite part of The Body Table? JL: My favorite part of the Body Table is the way that the public can passively and in a subtle way pick up on the ideals of four principles of ecology (Niche Adaptation, Commensalism , Mutualism and Competition) while simultaneously engaging with one of 17 stories that give them information they might use to improve or better understand their own biology and relationships with microbes. BP: The process of creating the BodyTable with my colleagues has been my favorite part. They are an amazing group of talented people. The Museum of Natural History in and of itself, is such a unique place here in NYC. And I wish the general public would have the opportunity like I have had to see the incredible work that takes place behind scenes of every exhibit in every corner of the museum. Its the ultimate collective of many brilliant talented people who everyday successfully mesh Art and Science. EC: My favorite part of the Body Table is the moment that highlights selected stories for each different chapter. (Niche Adaptation, Commensalism , Mutualism and Competition) What I really like about it is its vivid color change and integrated animation consists of vivid color change on the background, clear narration and beautifully refined small animations on sensors that attract the audience to try it. "The Secret World Inside You" runs from November 7, 2015 to August 14, 2016. 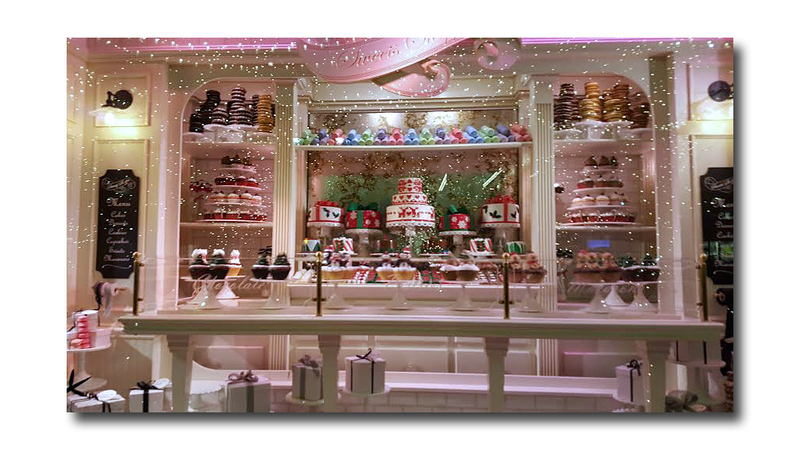 Take a break from the usual holiday fare and pay a visit to this enlightening exhibition. It’s an experience that will change the way you see yourself interacting with the world around you.